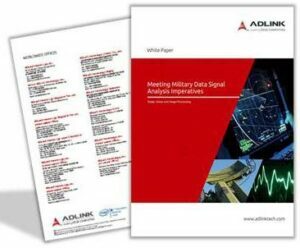 ADLINK Technology, a developer of rugged embedded computing solutions, has released a whitepaper that discusses the challenges and considerations for military data signal processing and analysis. Military Commanders have more data to assess than ever before, and are reliant on technology to convert it into real-time intelligence. This whitepaper looks at the various processors that are used extensively in military applications and which are best-suited for real-time signal processing and analysis. ADLINK Technology provides a wide range of GPGPU processing products, including VPX processor blades and cards, XMC modules, and HPERC (highly ruggedized, MIL-SPEC SFF standalone sub-systems), offering engineers powerful COTS products with which they can design the next generation of image processing systems, sonar receivers and high tech radar systems.